Pneumatic or flap valve governor used to regulate fuel injection of an internal combustion engine. Pneumatic Governors are all-speed types of a governor. It controls the whole speed range of an engine. These types of governor work upon the principle of the Venturi effect. They are responsive to the velocity of air in intake manifold of the engine. 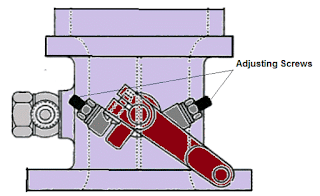 The pneumatic governor has two main parts. A Venturi section connected to air intake manifold – this section senses the air flow velocity and creates a vacuum according to the velocity of air. It contains a butterfly valve that connected to the accelerator pedal. A diaphragm unit mounted on fuel injection line – diaphragm unit mounted on end of the fuel pump can control the fuel supply according to the increase or decrease of vacuum produced by the venturi unit. The diaphragm has a spring on one side; a control rod is connected to another side. The adjusting screws are provided in Venturi unit to the adjustment of the maximum and idling speed of the engine. The velocity of air flow in the intake manifold of an engine is a function of engine speed. When the engine is stationary, the spring pushes against the diaphragm, and it keeps fuel supply completely open (maximum fuel supply position). 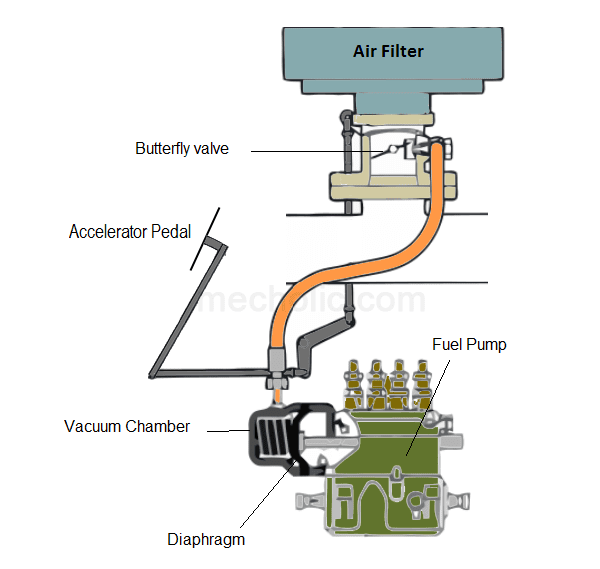 When engine running, the position of the diaphragm and then the fuel supply are determined by the vacuum created. When the load on an engine decreases, the engine speed increases. The faster the engine speed, the greater the air intake. That also increases in the vacuum produced by Venturi section mounted on the intake manifolds. The vacuum created in the venturi section pulled the diaphragm and the control rod. It then shut off the fuel supply. The decrease in fuel supply eventually decreases the speed of an engine. When the load on an engine decreases, intake air velocity also decreases. That results in decreasing the vacuum produced by the Venturi effect. The membrane on the fuel line move according to the resultant vacuum and then increases the fuel supply. The increase in fuel supply also increases the engine speed. In the case of a motor vehicle when the accelerator is pressed the butterfly valve opens and allows more air flow through it. However, it decreases the air flow through the auxiliary venturi unit that controls fuel supply (results more fuel supply). Similarly releasing accelerator close butterfly valve, but increases air flow through the venturi unit (results decrease fuel supply). They can control the speed of engine ranges from idling to the maximum. Excellent sensitivity for stable idling governor. Over sensitivity at higher speed - Cause a sudden change in engine torque. The velocity of flow is influenced by the density of air.